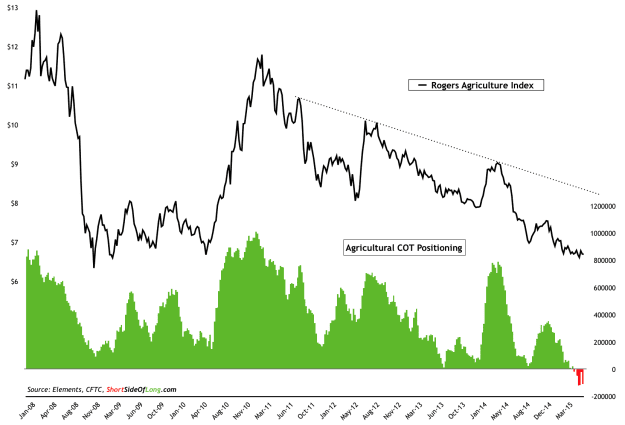 Agriculture Beaten Down & Hated: Buying Opportunity? The chart below from Short Side Of Long shows the dreadful price performance for agriculture since early 2011. The commitment of traders report has investors net short on agriculture for the first time in over a decade. Not only have investors sold out of positions, but they are betting heavily on further price declines. The fundamentals look rough for the market in the short term. The U.S. dollar is currently strong, supplies are already plentiful for many different types of food and it has been a great few years of weather for farming. This has caused many farmers to either cut back or redirect their crop production. I believe it's likely the perfect farming weather will not remain uninterrupted for another 10 years. I also believe the rapidly growing population around the world is going to continue to need food over the next decade, while new supply to feed that population is not being put into place today. A common term in the commodities market is "the cure for low prices is low prices." The exceptionally low prices seen today combined with horrific sentiment should be a welcome opportunity for long term investors. I have been buying corn (CORN), sugar (CANE) and wheat (WEAT) steadily for the past year, and I began purchasing the broader agriculture ETF (DBA) when it fell below 23 in March. I plan on continuing to buy each of these unless they move higher or positive sentiment returns to the market. My hope, as with the other commodity sectors I am accumulating in today (precious metals, uranium, oil) is that prices stay low and sentiment stays miserable for a long time. I very much enjoy your posts especially the ones that highlight how you are investing personally. Among the sectors discussed (oil, PMs, uranium, ag), which do you think has the highest upside or are you buying in similar proportions? PMs and oil seem most prone to non-market driven price manipulation. Why Millennials Are Not Buying Houses In The U.S.